***EMERGENCY: Our large scale rescue and adoption program has been put on hold. Zoning rules prohibit more than 100 animals at our rescue and adoption center. We need to raise much-needed funds to secure a new property and re-start life-saving program. If you would like to help with those efforts, please donate today. Animal Place’s Rescue Ranch is unique in that we work directly with egg and, sometimes, dairy farmers to provide an alternative to slaughter for a small percentage of hens in the egg laying industry and dairy calves. 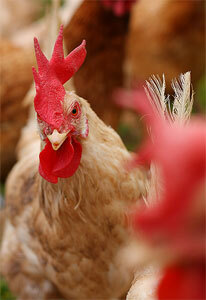 There are more than 18-20 million hens raised for eggs in California. Most will never find true sanctuary. The farms we work with range from small, pasture-based operations to larger facilities. Animal Place is honest – we are a vegan organization promoting compassion to all life. We may never see eye to eye with farmers on some issues, but we hope to find common ground in order to save as many lives as possible. Toward that end, we keep all information about cooperating farmers private, and they reciprocate by not using Rescue Ranch as a tool to promote the consumption of their eggs. We do not bring cameras or recording equipment into the farm and both parties sign confidentiality agreements. Rescue Ranch’s goal is save as many lives as possible, one individual at a time.